FA: John Shewchuk, Grant Hiskes, Bill Serniuk, George Ridgley, July 2004. Shares the start with Errett Out, but goes straight up from the first bolt. The first pitch has sustained climbing on small knobs, and is a tad runout. The second pitch is a stellar, long knob pitch. Pay attention while looking for bolts, since it’s easy to miss a few (particularly the last one). 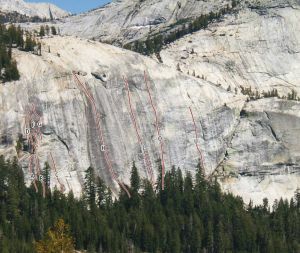 The third pitch goes past a short bulge to easy climbing. A final 4th class pitch is needed if you want to walk off instead of rappel. Which SuperTopo guidebooks include a topo for Bit by Bit?